Always trend-setting, innovating and testing the limits of their menus, college and university foodservice operators continue to grapple with changing tastes, demographics and expectations. 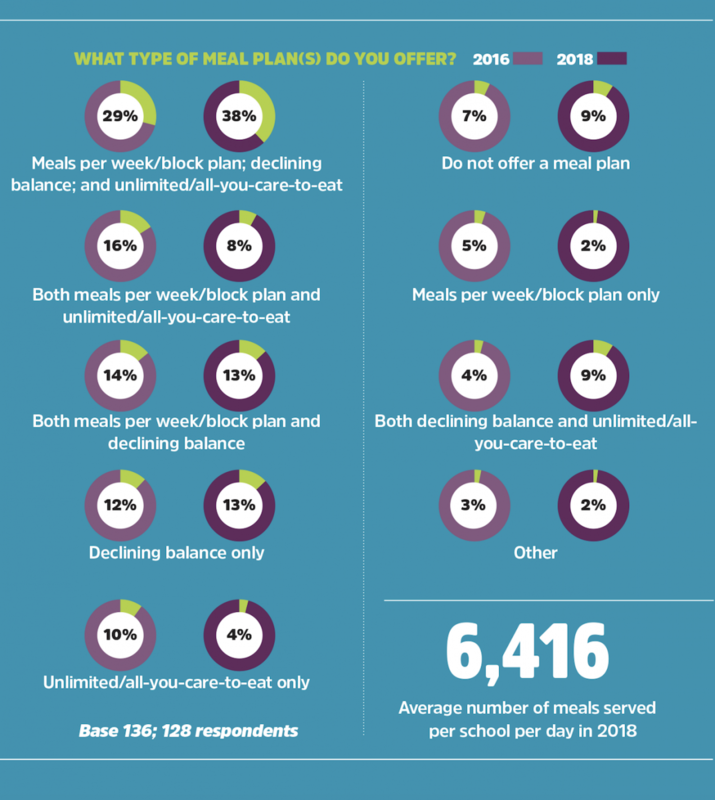 FoodService Director’s 2017 College and University Census reached 136 operators across the nation—51% self-operated, 45% contract managed and 4% a combination of both. Click below for the results, which are illuminating. As college and university foodservice operations become more and more sophisticated, foodservice directors are taking on more varied responsibilities. This year, 4% more FSDs are running c-stores, coffee shops, restaurants and more, in addition to dining halls, compared to 2016. FSDs are also wearing more hats than ever before, with just 3% of respondents saying they do not manage any additional auxiliary services. Of those who do, 58% run c-stores, 10% oversee a childcare program, 44% manage athletic concessions, 88% handle catering, 54% manage summer camps and 40% run a conference center. It turns out foodservice directors in colleges and universities aren’t that worried about restaurants stealing their diners. In fact, they’re stealing some of the ideas that are born in that industry. Trends in the restaurant industry are fast-paced and disruptive—and they’re helping to inform diners’ expectations. As foodservice directors and chefs examine their own programs and menus for ideas and ways to meet those rising expectations, many top restaurant innovations are primed for adoption by noncommercial operations. Among survey respondents, 11% said that restaurants are a big threat to their business, while 47% said they are a minor threat and 42% said they're not a threat at all. 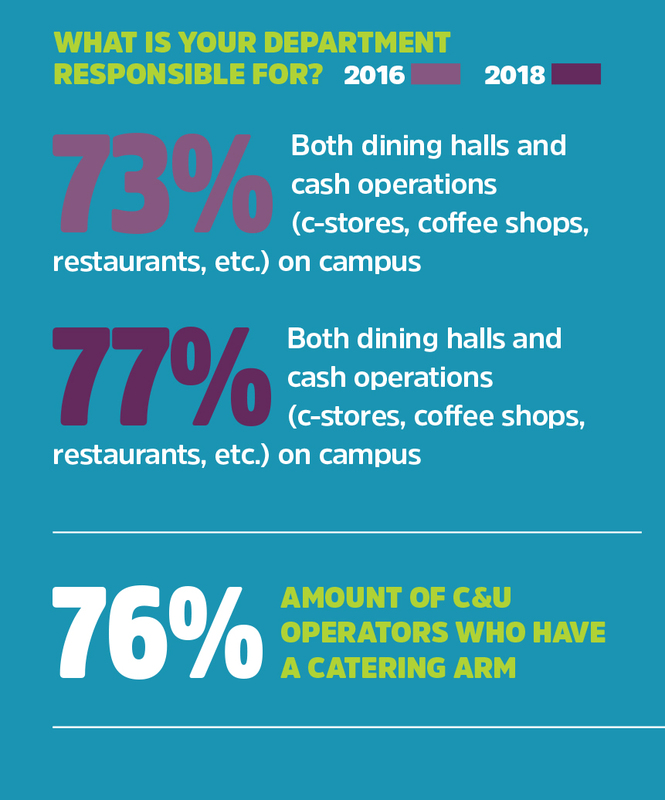 Last year, as part of Technomic’s 2017 College and University Consumer Trend Report, 35% of students said they are satisfied with their school’s foodservice facilities, and 34% indicated that their school does a good job of ensuring they are happy with the dining program. In that survey, 41% said they’re more likely to purchase food on campus because it tastes better, and 40% said they purchase it on campus because the quality is higher. While locally sourcing food remains the largest trend affecting college and university operators, the amount of operators citing it as a huge trend is 18% fewer than in 2016. The only trend on the rise is the inclusion of vegan options, with a 7% increase over 2016. Produce is the top ingredient being locally sourced by college and university operators (88% source it local), with dairy coming in second (76%). But 95% of survey respondents are sourcing at least some their ingredients locally. Sixty-five percent of respondents use at least 10% organic product, while 24% use 11-20% organic. In colleges and universities, finding team members who can not only prepare great food, but also interact at a higher level with student customers is a struggle. Savvy operators aren’t just looking at quality service and quality food. More and more it’s about offering quality experience, which requires a different level of engagement from employees. And to make the hiring process even more complex, operators are facing local and federal minimum wage increases, which has resulted in 38% more operators reporting that they are hiring more part-time and seasonal workers as a result, compared with 2016. Menu updates come and go—sometimes, operators can change their recipes and adjust purchasing on a dime to meet diners expectations around on-trend flavors and dishes. But keeping up with the footprint demands of a high-yield facility is another challenge entirely. Renovations and new construction, whether major or minor, are popping up on campuses across the country regardless of the challenges, but in many cases to keep up with those previously mentioned diner expectations. Among survey respondents, 13% are rehabbing or have rehabbed their entire facilities in the past year, while 48% did so with part of their facilities.